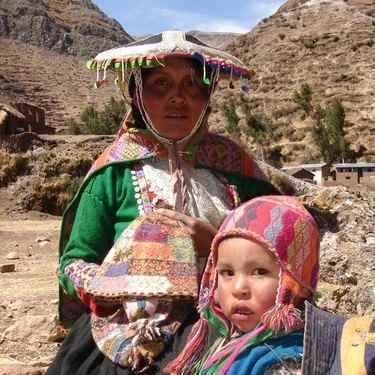 Alejandro and Bacilia and their baby live in a small adobe hut with a grass roof and dirt floor. Their house is approximately 2.5m by 4m and has a low roof and a small entrance only 1 metre high to minimise heat escaping. Very few trees grow at an altitude of 4500 metres so Bacilia uses dung from sheep and alpacas as fuel to cook potatoes. They have a gas stove but have little opportunity to purchase gas to fuel it. A few furtive guinea pigs hide in the shadows and creep out to feed on food scraps. Mamacha buys the beautiful traditional hats that Bacilia knits. The process is lengthy and highly skilled. She starts by dyeing sheep’s wool in earthenware pots using plants, flowers, lichen and insects. Once the dye has fixed she spins the wool with a small wooden spindle. When she has many different coloured balls of yarn she begins knitting hats using the designs passed down through the generations. The money she earns means she can afford essentials like medicines and school expenses. Francisca, Benedicta and Necolasa (left to right). At an altitude of 4500 metres, families subsist by growing potatoes in fields irrigated by a glacial melt stream. Their sheep and alpacas are able to forage for food on the steep mountains surrounding the villages. These families are largely self sufficient but they still need money to pay for healthcare or to school their children and to buy vegetables and food that cannot be grown where they live due to the harsh climate. 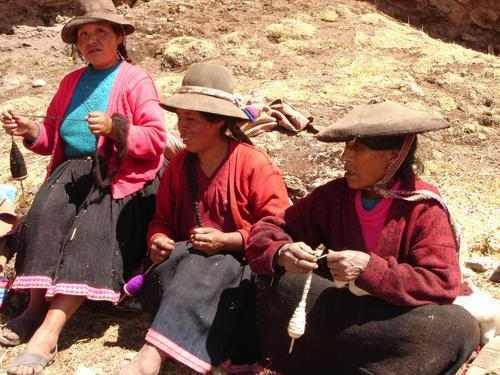 Although skilled at raising sheep, dyeing wool, spinning and knitting, they are often forced to accept low prices when selling their products locally. The project driven by Mamacha gives these people an opportunity to sell their hats at a fairer price. Click here to read interviews with two of the hat knitters which give an insight into daily life.